6 Below is the second stranded-on-a-mountain yarn we have gotten in two weeks and, although this one is based on a true story, that doesn’t make it any better than the fictional The Mountain Between Us. In fact, without the considerable talents of Idris Elba and Kate Winslet, 6 Below suffers from a charisma deficit. That’s not intended to disparage the efforts of lead actor Josh Hartnett, who does a decent job as trapped snowboarder (and former professional hockey player) Eric LeMarque, but he doesn’t rivet the camera’s attention the way Elba or Winslet can. The adventure/survival aspects of the movie are presented with workmanlike efficiency by director Scott Waugh (Need for Speed), but the flashbacks and secondary story elements are at times cringe-worthy. Eric ends up in an unfortunate situation as a result of poor decisions; it’s tough not to argue that he deserves what he gets. If you do stupid things, the outcome often isn’t going to be a happy one. Despite hearing a weather report that a storm is on the way, Eric decides that he needs to go to the peaks of the High Sierras to clear out his head – he has a court date coming up in 6 days. Once on the slopes, he decides the regular trails aren’t challenging enough so he starts a descent into unmarked territory and becomes lost. The next week is spent enduring hellish conditions, fighting off hypothermia, and combatting severe frostbite. The fact of his survival is nothing short of miraculous – something voiced by the team that finds him. While Eric is fighting the elements, his mother, Susan (Mira Sorvino), is trying to convince Sarah (Sarah Dumont) to order a search-and-rescue operation for her son, who has disappeared. These scenes are generally unconvincing with Sorvino overacting and the re-creation of the behind-the-scenes rescue efforts turning every member of the search team into a candidate for canonization. The movie as a whole isn’t good with character “gray areas.” Eric’s drug addiction is treated as a relatively minor failing (although being stranded on a mountain in sub-freezing temperatures for a week seems like a radical way to kick the habit). 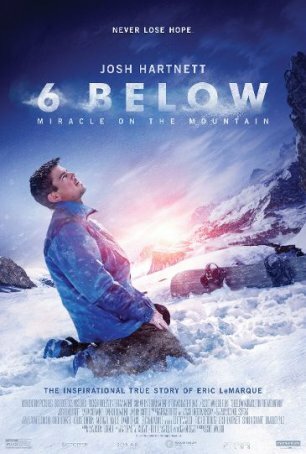 6 Below is meant to be inspirational and, although it’s not specifically designated as a faith-based movie, it often feels like one. Eric’s determination is admirable but I’m more interested in understanding how he survived so many hours in such a harsh climate without succumbing. There’s also a sense that his suffering has been sanitized for PG-13 audiences and, as a result, the uglier aspects of what he endured were elided from the screenplay. That’s one problem with a “based on a true story” movie where elements are whitewashed for mass consumption: they often feel less honest than entirely fictional stories of the same type.